Now that we had all the flow sensors under water, the last big item on the to-do list was the installation at Rio Secreto. New memory cards brought all the 1st generation units down to a more reasonable 0.33 mA sleep current. The new builds were even better, coming in around 0.22 mA, and they have 32k eeproms allowing them to buffer up to five days worth of data. Not wanting to risk too much on an untried idea, only three of the new builds are pin-powering the RTC, allowing them to get below 0.15 mA between drip counts. I have high hopes for this whole generation, and each has slightly different settings, to help me zero-in on an optimal approach to the eeprom buffering. Aubri and Ben record drip intervals at a 3-unit cluster. 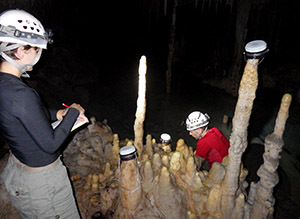 The first chamber (which we started calling Fernanda’s Lab) had a beautiful stalagmite garden on offer, and we tried to cluster drip sensors on actively growing stalagmites of different heights and shapes. 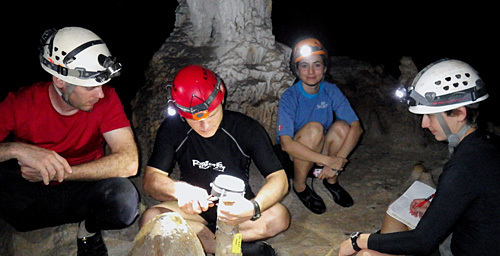 Understanding how drip dynamics and vadose zone chemistry contribute to stalagmite growth is something of a holy grail for my wife, as it underpins all the paleoclimate records that people derive from cave formations. Of course if figuring that out was easy, someone would have done it already. So we set to work locating drips with the “right stuff”. Five units ended up in the stall garden, with another cluster off at a more distant pool. Units 04, 05 and 07 were replaced in their former locations with more robust anchoring this time, as these locations had been washed out by a high water event during the last deployment. I put the new babies under a dry ledge to keep liquid water away from the humidity sensors. The last data set gave us a gorgeous pressure & temperature record from the MS5803-02 and I continue to be impressed by sensors from Measurement Specialties. 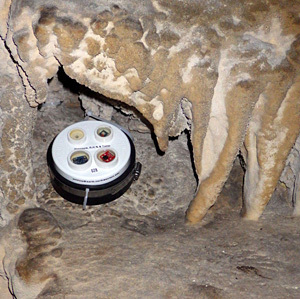 This time round we had two pressure & RH sensors to deploy in the cave, but I have no idea if those HTU21d’s will survive such long exposure to the high humidity cave environment. The 5bar pressure logger that we patched up with glue was going to be deployed on the surface, with a drip sensor beside it acting as a crude rain gauge so we can get a better sense of what the cave drips are responding to. By the end of the day we had fifteen instruments on site, making this our largest installation ever! This entry was posted in Developing a DRIP ⚶ sensor, Expedition Reports & Updates on January 18, 2015 by edmallon.